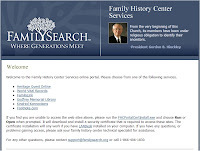 FamilySearch informed Godfrey Memorial Library Director Richard Black a week ago that they had worked out the problems with access to the Godfrey website for Family History Centers (FHCs). Today, several FHCs reported online that the FamilySearch department was calling centers individually to walk them through the setup. Renee Zamora of the Alpine Utah FHC and "Myrtle" of the Bellevue Washington FHC explain the steps they took to get access. The menu screen (above) appears exactly as the Insider previously reported, with the addition of support information.